Author(s): Jiajie Guo, Wenwen Zhao, Wenhui Hao, Guowen Ren, Jinjian Lu, Xiuping Chen. Institute of Chinese Medical Sciences, University of Macau, Av. Padre Tomas Pereira S.J., Taipa, Macau, China. Keywords: Apoptosis, cancer, cucurbitacin B, DNA damage, G2/M arrest, ROS. Affiliation:Institute of Chinese Medical Sciences, University of Macau, Av. Padre Tomas Pereira S.J., Taipa, Macau, China. 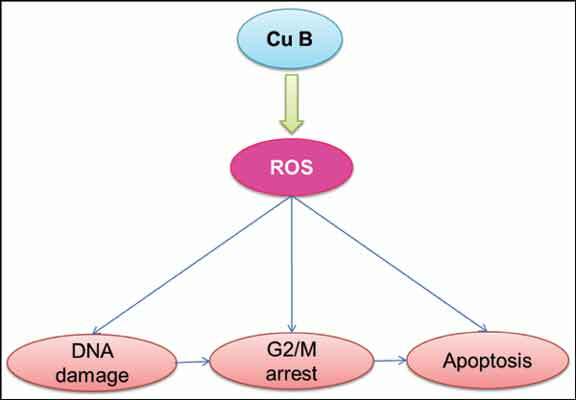 Keywords:Apoptosis, cancer, cucurbitacin B, DNA damage, G2/M arrest, ROS. Abstract:Cucurbitacin B (Cuc B) is a natural product with potent anti-cancer activities in solid tumors. We investigated the anti-cancer effect of Cuc B on K562 leukemia cells. Cuc B drastically decreased cell viability in a concentration-dependent manner. Cuc B treatment caused DNA damage, as shown by long tails in the comet assay and increased γH2AX protein expression. Immunofluorescence, Fluo3- AM, and JC-1 staining results showed that Cuc B treatment induced nuclear γH2AX foci, increased intracellular calcium ion concentration, and depolarized mitochondrial membrane potential (MMP), respectively. Cuc B induced G2/M phase arrest and apoptosis, as shown by flow cytometry, DNA fragmentation, and protein expression analyses. In addition, Cuc B dramatically increased intracellular reactive oxygen species (ROS) generation as measured by DCFH2-DA. N-acetyl-l-cysteine pretreatment significantly reversed Cuc B-induced DNA damage, increased intracellular calcium ion concentration, and reduced MMP, G2/M phase arrest, and apoptosis. Taken together, these results suggested that ROS mediated Cuc B-induced DNA damage, G2/M arrest, and apoptosis in K562 cells. This study provides novel mechanisms to better understand the underlying anti-cancer mechanisms of Cuc B.